In my college journalism classes, I learned the importance of saying what you mean in as few words as possible. Doing so results in a story that is both shorter and stronger. Choosing exactly the right word, instead of several nearly right ones, takes skill and a good vocabulary, which probably explains why many writers don’t bother. I appreciate it when an author does, and for many years, would cite Hemingway’s “For sale: baby shoes, never worn” as the perfect example. These six words seemed to be human tragedy concentrated into its purest form. But a few days ago, in my copy of The Week, I read about this note, which floated down from the towers on 9/11. It took my breath away. Then I read further and learned that the writer was identified but a dark spot on the paper which proved to be a drop of his blood. Hemingway’s talent suddenly seems trivial. 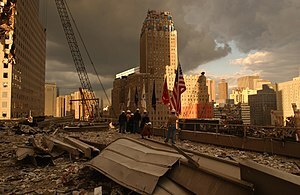 Read the story in its entirety (a scant two pages) at http://theweek.com/article/index/233252/remembering-911-a-message-from-the-south-tower. This entry was posted in Rave, Writing and tagged 9/11, Being succinct, Message from the South Tower, word selection in writing. Bookmark the permalink.